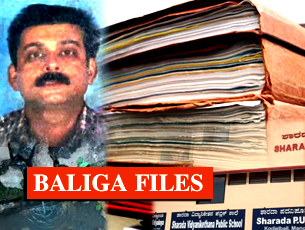 Mangaluru, July 11, 2016: Here is a case from Baliga files that his associates are following up. When case no.TP/1086/12-13 Eh was called at the office of the Commissioner of the Mangalore City Corporation on the 24th of March there was no response from either of the parties. That was because the complainant Sri Vinayak P. Baliga was absent as he had been sent out of the world - he had been brutally murdered in front of his house allegedly by hired killers on the 21st of March at around 6 a.m. 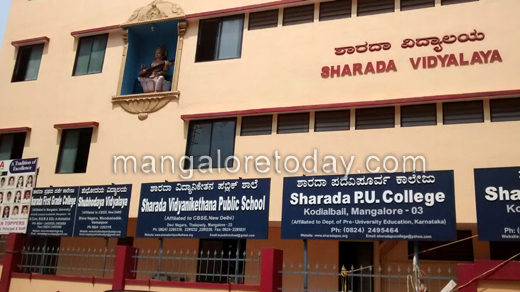 The respondents were Dakshina Kannada Dravida Brahmins Association, Sharada School and Tulunadu Trust who also did not choose to turn up. The allegations were that they have put up buildings on TS no.340 without proper license and have started using them without occupancy certificate by the corporation authorities. It was also alleged that the buildings are not being used for the purpose for which they were constructed and there were violations and deviations from the plans which had been approved by the corporation. He had stated that the narrow road was blocked due to parking of the vehicles waiting to pick up children from the school and problems were being caused in the residential locality due to these commercial activities. 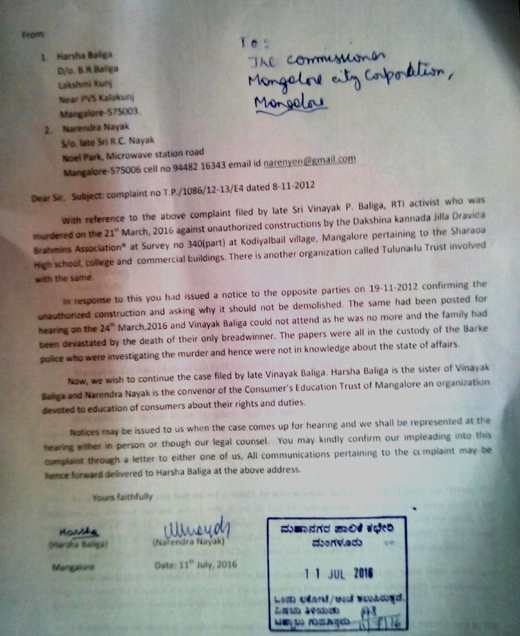 To support his contention he had submitted a communication from the Commissioner of Mangalore City Corporation no.e428:cr72:12-13 which had categorically stated that the buildings under survey no TS 340(part) under RS no.501, Kodialbail village had been granted permission to build as follows. So, it was not a minor violation but a build up space of more than twice the licensed area! The commissioner had also issued notice under section 308(1) of the Karnataka Municipal Corporations Act and had warned that unless the deviations were rectified within seven days of the date of the notice (which was dated 19-11-2012) it would be demolished at the cost of owners and the amount collected from them. They had also asked the respondents to submit the plans of the newly constructed building within seven days of the date of the notice. The fact is that it is 2016 and the building still exists and going strong! The road is still narrow and gets blocked. 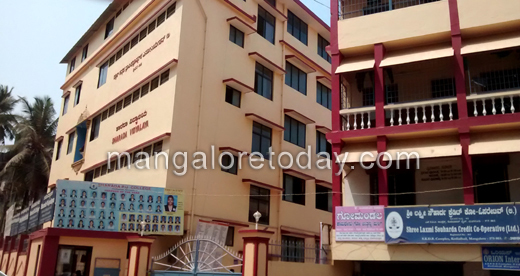 The residents still suffer and the Mangalore City Corporation is in deep slumber. Perhaps that is a sign of ‘smartness’ for a city which aims to get the smart city tag! With the complaint having become infructuous the violators can be happy for some more time. But, a group of citizens are planning to re submit the complaint or get impleaded into the case. As a senior lawyer remarked such complaints are not civil cases and do not become extinct if the complainant is eliminated. We are waiting to see what action the commissioner will take on the issue which still exists. We are waiting for the demolition to start! With the murder and justice for Baliga occupying all our time, we had been busy with bringing the accused to book. Now that the charge sheet is submitted, we decided to go ahead with our plans to continue the activism of Baliga. So today we filed a petition with the commissioner of Mangalore City Corporation to implead ourselves into the case. Baliga’s sister Harsha and I have filed the enclosed petition and will be waiting for action from the Corporation authorities. More are expected to join in. If the person of the intentions are good always the lord will shower his blessings on us. Vinayak baliga had strong evidence so they might have decided to terminate him to destroy the files. We have to blame the Corporation for giving licence to the building. These days there is no value for truth and honesty.